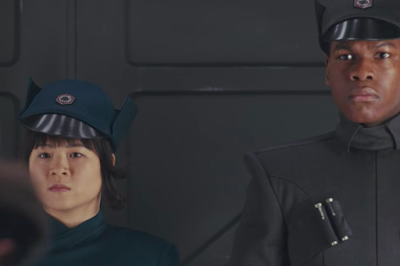 In the behind the scenes sizzle reel for Star Wars: The Last Jedi released at the D23 Expo last month, there is a brief moment where John Boyega and Kelly Marie Tran are seen decked out in First Order officer uniforms. This, of course, begs the question, why are two members of the Resistance wearing their enemy's uniform? Fans speculated that this was because The Last Jedi would see Finn and Rose go undercover and infiltrate the First Order. Boyega confirmed this speculation in a recent interview he did with IGN while promoting his new movie Detroit. Boyega said, "I always wanted to go undercover. Star Wars undercover is different because you wear a hat and all of a sudden no one recognizes you." "Well, it's like imagine you work at McDonald's. You push your manager into a chute compactor and then a year later you decide to go back dressed as one of the colleagues. It's not the best situation. There's a lot of chasing, there's a mission that needs to be completed but that isn't necessarily something that doesn't come without a fight and it's something that he's gonna have to face for himself." Hilarious metaphors aside, it does sound like this sequence with Finn and Rose will a lot of fun for audiences--if not for the characters. Do you think that the time frame of this movie could span a year of time?